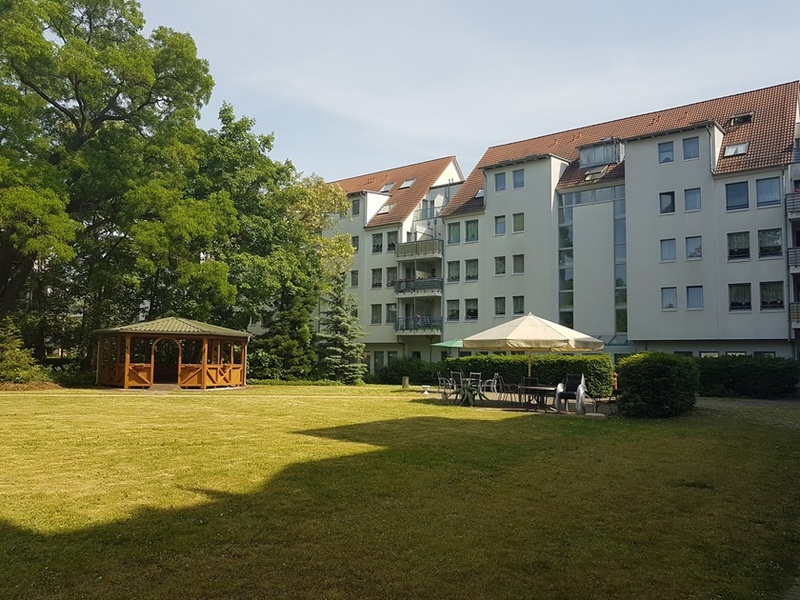 In the Neuen Neustadt of Magdeburg, a retirement home with 167 apartments was built in 1998 on Morgenstrasse, on the corner of Hamburger Strasse, as well as support and service facilities as well as integrated shops, medical and service rooms. The concept "Living Plus" is tailored to the needs of older people, i. Living independently in your own home, but if necessary, to get help and care. The concept combines independence and individuality with the desire for security and social inclusion. In addition, the system was consistently planned and built down to the aspects of comfort, safety and ecology. But also the design of the living environment, i. the integration into lively city and neighborhood structures, utilities with contact and communication possibilities, counseling, free time and conviviality were considered. The two main wings of the senior residence are located on the south and west side of the very spacious area and were built in the course of Morgen- or extended Brueder-Strasse of high-crowned deciduous trees. On the ground floor is the popular panorama café. Directly connected, on the ground floor of the south wing, is the support center of Malteser Hilfsdienst with meeting rooms for u.a. Festivities, lectures, etc. Here is also the emergency center. This form of housing for seniors is increasingly in demand from society. This has been observed since the construction of this complex and can also be proven. The housing market will change dramatically in the coming decades. A steadily growing proportion of people in Germany will live in appropriate retirement homes. Thus, this investment is a very sustainable and future-oriented. Analysts speak of the future market number 1. The Neue Neustadt is an established district with mature structures north of the center of the state capital Magdeburg. On the Luebecker Straße and around the Nicolaikirche, in recent years, a busy business life with all facilities of the residential and beyond supply developed. Supermarkets, retail and specialty shops, pubs and restaurants, as well as banks, social and recreational facilities. Within sight and within walking distance to this shopping and district center is this beautiful and idyllic retirement home. We offer various apartments within this condominium. These are reached by spacious stairwells with age-appropriate elevator systems, which are all on the courtyard side. The apartments are very well cut. You have a large living room with a balcony. In the basement are in addition to the necessary function and apartment-related basements nursing and sauna including supplementary facilities housed. These areas are directly accessed via the elevators so that the building does not need to be left for use. The functional design of the system and harmonious building design are also reflected in the floor plans of all apartments. The apartments are accessible via a private vestibule, from where the kitchen, bathroom and living room are directly accessible. The center of each apartment is a well-proportioned living room with a balcony to the hochkronigen deciduous trees of Morgenstrasse and the intensive greening of the park-like landscaped courtyard and gardens. The separate bedrooms can be opened to the living room through double sliding doors. All apartments have senior-friendly bathrooms with stepless showers, grab bars and are adapted to the needs. Furthermore, all apartments have fitted kitchens. The responsible administration takes care not only of the community property, but also of all necessary settlements, correspondence, correspondence, as well as the new lease in case of termination. Ask us! We advise you comprehensively! Saxony-Anhalt (German: Sachsen-Anhalt) is a landlocked federal state of Germany surrounded by the federal states of Lower Saxony, Brandenburg, Saxony and Thuringia. Its capital is Magdeburg and its largest city is Halle (Saale). 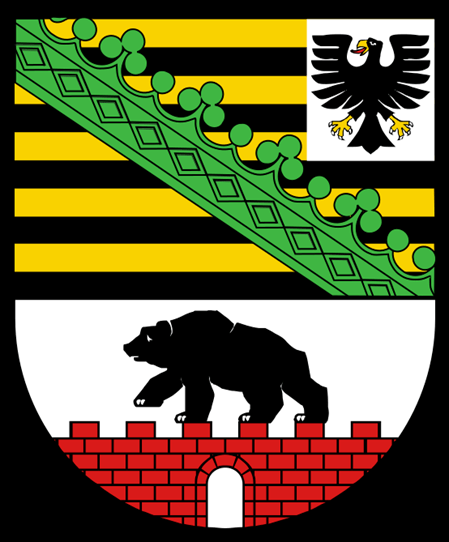 Saxony-Anhalt covers an area of 20,447.7 square kilometres (7,894.9 sq mi) and has a population of 2.23 million. It is the 8th largest state in Germany by area and the 10th largest by population. 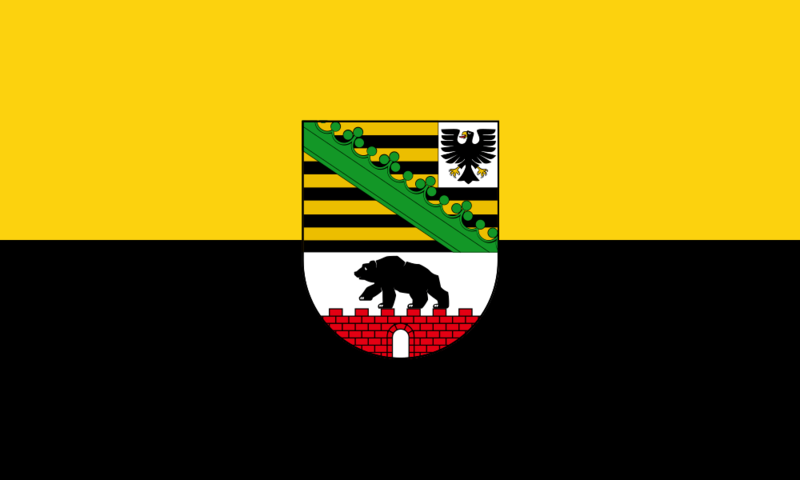 The state of Saxony-Anhalt grew out of the former Prussian Province of Saxony and Free State of Anhalt during Prussia's dissolution after World War II. In 1945 the US army administration and, subsequently, the Soviet army administration organised the former province's territory into the new state. The state became a part of the newly established German Democratic Republic in 1947, but in 1952 the state was dissolved and its territory divided into the East German districts of Halle and Magdeburg, with the exception of the city of Torgau, which joined the district of Leipzig. After German reunification in 1990, the state was re-established, leaving out Torgau. 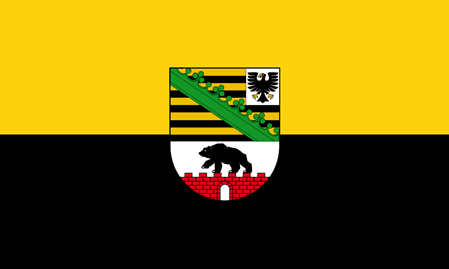 Saxony-Anhalt is one of 16 states (called Bundesland) of Germany. It is located in the western part of eastern Germany. By size, it is the 8th largest state in Germany and by population it is the 10th largest. It borders four other states: Lower Saxony to the north-west, Brandenburg to the north-east, Saxony to the south-east and Thuringia to the south-west. In the north, the Saxony-Anhalt landscape is dominated by the flat expanse of the (North German Plain). The old Hanseatic towns Salzwedel, Gardelegen, Stendal and Tangermünde are located in the sparsely populated Altmark. The Colbitz-Letzlingen Heath and the Drömling near Wolfsburg mark the transition between the Altmark region and the Elbe-Börde-Heath region with its fertile, sparsely wooded Magdeburg Börde. Notable towns in the Magdeburg Börde are Haldensleben, Oschersleben (Bode), Wanzleben, Schönebeck (Elbe), Aschersleben and the capital Magdeburg, from which the Börde derives its name.